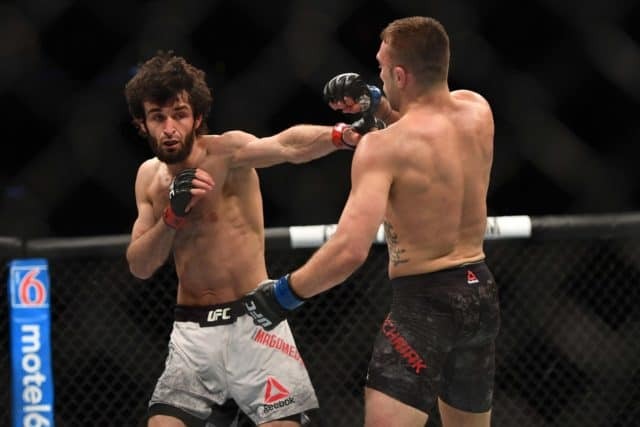 One of the most hyped up-and-coming prospects in mixed martial arts looked to further his rise when featherweight Zabit Magomedsharipov met Kyle Bochniak on the main card of tonight’s (Sat., April 7, 2018) UFC 223 from the Barclays Center in Brooklyn, New York. Bochniak came out aggressive, closing the distance on the lankier Dagestani and throwing shots. Magomedsharipov threw an effective sidekick and looked for his openings. Bochniak kept the movement up but was kicked right in the body. Bochniak threw wild, looking for a home run. A spinning back kick almost hit big for Magomedsharipov. He attempted a cartwheel kick to oohs from the Brooklyn crowd. Magomedsharipov snapped more kicks and jabs as he calmly shrugged off a clinch attempt from Bochniak. He threw a jumping switch kick and leg kick, clinching with a big knee. The touted prospect landing a pinpoint head kick and Bochniak some solid shots. Magomedsharipov went for a big spinning backfist and the fighters traded shots. Bochniak continued rushing forward somewhat wildly but did land some more punches as an exchange ended the back-and-forth first round. Bochniak rushed in again to start the second, but Magomedsharipov threw more of his trademark kicks. He ducked under and attempted to take Bochniak down, briefly slamming him and looking to take his back. He ground Bochniak with a bodylock to double leg takedown. Magomedsharipov smothered him briefly and the fighters got back to his feet with Bochniak taunting Magomedsharipov to hit him. He kept it up with kicks but Bochniak landed a strong punch. Magomedsharipov landed a big step-in uppercut and then beautifully tripped Bochniak, who looked for an armbar from the bottom. Magomedsharipov escaped and Bochniak got to his feet as they traded strikes in the center of the Octagon. Magomedsharipov threw the spinning backfist again and caught Bochniak with a knee as he rushed in. Magomedsharipov threw another spinning backfist and spinning kick as the second round ended. Bochniak came out firing again in the third, throwing wildly but again not landing too many punches. Magomedsharipov tagged with a left hook, then stifled Bochniak with a spinning back kick as he rushed in again. Magomedsharipov looked to ground Bochniak near the fence, but Bochniak reversed only briefly to be taken down again. His grappling game was stifling as he tripped Bochniak when he got back up, but Bochniak slipped out and assumed the advantage. Bochniak grabbed a leg and looked for the takedown, but Magomedsharipov went for a jumping kick off of it. 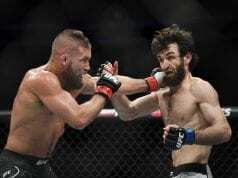 The final minute of the great fight saw the fighters throwing all-out as Magomedsharipov was tired and Bochniak found his second wind. 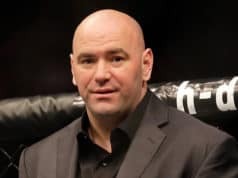 The two exhausted warriors left it all in the cage as they threw and landed endless flurries to close the amazing fight as it left the Brooklyn crowd standing. In the end, Magomedsharipov took home the unanimous decision, but both fighters made a big name for themselves.